With the cost to move proving to be expensive many homeowners are improving their properties. This cost combined with rising energy bills means that methods of improving insulation and energy efficiency in their homes has become a key priority and one of the easy ways to insulate your homes is by using DIY Spray Foam Insulation. 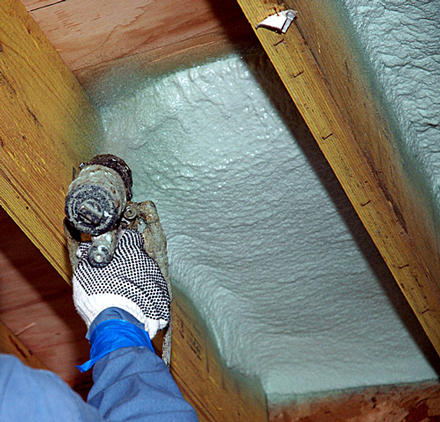 Spray foam insulation is an alternative method of insulating your homes than the traditional method of insulation using fibreglass or rigid insulation sheets. 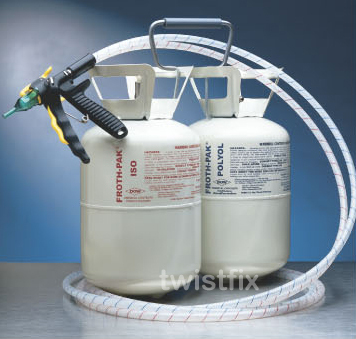 The system uses two pressurised tanks, linked by hoses, to a dispensing gun. When the contents of the two tanks are dispensed, they chemically react at the tip of the dispenser to form closed cell foam which quickly expands to about three to five times the dispensed volume. Twistfix DIY Spray Foam Insulation kit produces Polyurethane expanding foam, which is non-toxic once cured. However we strongly recommend that you wear protective clothing, mask, gloves and eye-wear when you spray the insulation. If you are looking to increase the thermal performance of your home through the insulation of the roof, walls and floors then the DIY Spray Foam Insulation is a quick, easy and versatile solution.­ Just 15mm of foam can significantly alleviate condensation and reduce heat loss, which ultimately saves you money on your energy bills. For more information then please contact Twistfix on 0845 1236007 or email sales@twistfix.co.uk.